The implications of the ex nihilo doctrine are radical when contrasted with the confusion of nature and God which is often characteristic of pagan and polytheist faiths. For example, the world does not exist eternally but, as St Augustine emphasised, both space and time were created with matter and energy, making the terms “before creation” and “after creation” meaningless. So, there is creation “before” time (a singular Big Bang or multiple primordial creations) and creation in time as the one Cosmos or the Multiverse evolves. Before-time creation is possible in so far as God in His essence utterly transcends anything He creates. In-time creation is possible because God embeds Himself in the Cosmos from the outset by His energies. 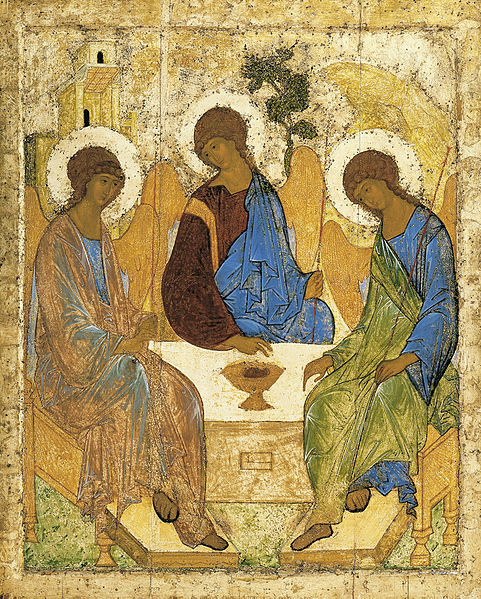 (I shall explain further this classic Orthodox distinction between the essence and energies of God in the next theological section: “God is both Creator and Trinity” but for now let us return to consider ex nihilo from the non-theistic perspective). The atheistic scientific approach denies a priori the existence of anything other than the Cosmos, (or in the “Many Worlds” hypothesis, the Multiverse), in this case, God. Under this view, creation makes itself, there being no extrinsic or for that matter intrinsic divine agent to bring it into being. However, such spontaneous creation is never actually explained in such theories without some sort of precursor. Two favoured current theories either involve a quantum irregularity in the substrate vacuum which super-inflated like a bubble in a boiling pan of milk or the collision of two higher dimensional sheets or branes which triggered the Big Bang in the energy of their collision. None of this solves the puzzle as to why there should be a bubbling quantum foam or a system of colliding branes in the first place. The precursor may be necessary and true, but whatever “it” is, it is not nothing or non-being. The search for a First Cause or an Origin only ceases if a beginning is considered unnecessary, and then one is stuck with the brute fact of an eternal, infinitely regressive universe. Whether or not the Universe is eternal still ignores the favourite old elephant in the corner. This is his question: – “Why is there something rather than nothing?” Science is not equipped to answer “why” questions such as this, whereas such unfathomable existential issues are “food and drink” to the philosopher and the theologian. The hubris of an all-inclusive positivism for atheist scientists enables them to claim scientifically that no such theological answers can exist in principle. That is to step beyond the boundary of empirical science itself into belief, in this case the belief we call “unbelief.” It must be recognised that there are questions and answers in life that do not submit to the scientific method because they deal with references that are by definition not measurable. Measuring my heartbeat alone will not reveal whether or not I am in love. So far we have examined the truth claims and methods of science and religion from the shared perspective of the great Abrahamic monotheisms of Judaism, Christianity and Islam. We shall now look to the specific insights of Orthodox Christianity—a very different territory of enquiry with surprising discoveries in store. As we have observed, it is the transcendent majesty and glory of God, his singular unexcelled and excellent being that concerns all truly monotheistic faiths. Any conceptualisation, image or formulation concerning God in his essence or being is idolatrous and to be rejected. There can be absolutely no ontological overlap between God the Creator and Uncreated One and creation. However, to say that God is utterly distinct from creation at the level of his essence is to contribute nothing to an understanding of how he can be known by humankind through his covenanted grace, his theophanies or self-manifestations and supremely by his Incarnation in the Word made flesh (John 1:14). The Scriptures and the Tradition of the Church teach that God manifests himself in creation without being absorbed by it or fused with it, which of course would be pantheism. By way of contrast, the Orthodox teaching that incorporates the reality of the Divine Presence is called panentheism and this received its classic formulation in the distinction made between the essence and energies of God in the works of St Gregory Palamas. The energies of God are sometimes referred to as his immanence in creation. God is not to be thought of, therefore, as only acting “from beyond.” He also (by His energies) acts from within. When the Jews reflected upon this immanence in the context of their own covenant experience, their sacred writings made a distinction between the Word of God and the Spirit of God. Later the Wisdom of God was added. The Word of God could be described as his powerful creative and prophetic utterance. Noteworthy in this regard is this verse from the prophecy of Isaiah:- So shall My word be that goes forth from My mouth; It shall not return to Me void but it shall accomplish what I please, And it shall prosper in the thing for which I sent it. (Isaiah 55:11) If the Word of God is that in God which brings something to fruition in a declaratory manner, the Spirit of God is that in God which imparts his life to that which his Word has brought into being. The Wisdom of God is that which may be known from both his Word and Spirit; it is in effect a term of revelation and dependent upon the other two for its operation. When the Word became flesh in the Incarnation of Christ and later when the Holy Spirit was given to the Church at Pentecost, the Apostles learned through their own experience that this Word and the Spirit have their own distinct hypostatic or personal identities, but always in relation with each other and not as separate individualities. That which had been hinted at in the Old Covenant was fully revealed in the New Covenant; and Church Tradition was later to make sense of this in monotheistic terms by the doctrine of the Holy Trinity. St Irenaeus referred to the Word and the Spirit as the two hands of the Father (Against the Heresies, 5.6), but it was not until the Cappadocian Fathers clarified the terminology in the 4th century that the Church’s experience of the Trinity was thoroughly articulated. The only change that the doctrine of the Trinity made to traditional monotheism concerned the hypostatic distinction of both the Word and the Spirit, both between themselves and with the Father. However this distinction was not applied to the essence or being of God which remained as it always had been – a simple, undifferentiated, identical consubstantiality. In this Orthodox sense the hypostases always remained co-equal and undivided.